There is another binocular comet gracing our night skies, and this may be the last one of the year. It’s hovering just below naked-eye brightness at the moment, but it’s high in the evening sky (none of this early pre-dawn nonsense), in Bootes, between Arcturus and the Big Dipper, very close to where Comet 45P was back in February. This time, I was actually able to get a picture of it BEFORE writing about it! The shot above was taken last night with just a Nikon DSLR, and even with the low resolution you can make out a stubby tail headed up and left. The glow at lower right of the frame is the effect of the almost-rising gibbous moon, and the two bright stars in that glow are the edge of the Northern Crown, Corona Borealis. That reminds me – as promised, a brief discussion of newly visible constellations is in order. The next Zodiac constellation (after Leo) is now high enough to be readily visible after sunset, though it suffers from having few bright stars and no easily recognizable asterisms. Virgo is marked most easily by the bright star, Spica, and currently, Jupiter, which is hanging almost directly above it. Virgo’s head is near Leo’s tail, and Spica marks the midpoint of the constellation, usually marking her left hand (right, as you look at her). Bootes, the herdsman, you recall, is the large kite-shaped constellation that bridges the gap between Virgo’s waist and the handle of the Big Dipper, aka Ursa Major’s Tail. You can use the Big Dipper’s arc to find both – “Arc to Arcturus” (in Bootes), then “Spike to Spica” along the same trajectory. Of course, with Jupiter nearby, Spica may not require all that leaping from Ursa Major. 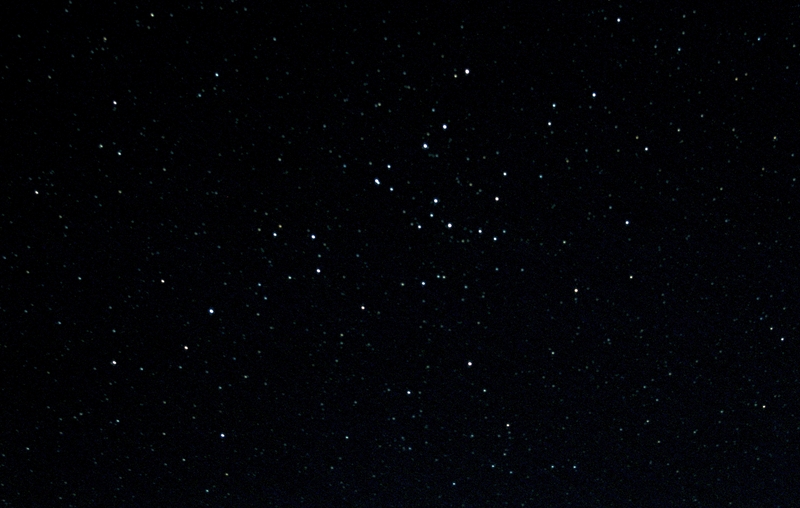 Below (East) of Bootes is a semi-circle of stars that make up Corona Borealis, the Northern Crown. Above (west), and near Virgo’s head and Leo’s rear haunches, is a mostly-dark patch with a beautiful open cluster, Coma Berenices, or “Berenice’s Hair”. This area doesn’t have much in it – but point a pair of binoculars toward this region and the sky pops with countless stars in a beautiful, if dim, cluster. 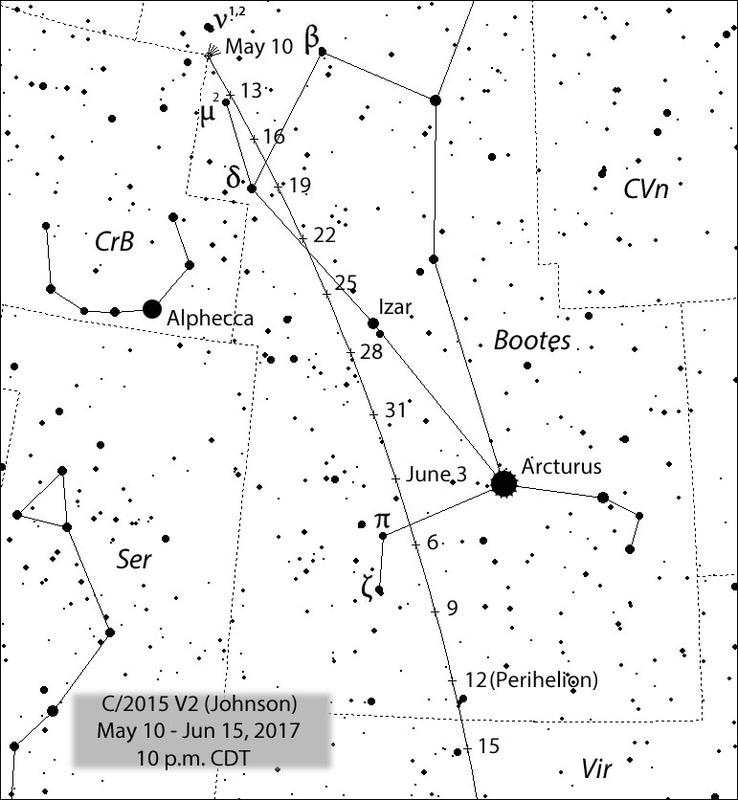 Hopefully you can get a look at both Coma Berenices, and Comet Johnson this week. Don’t overlook Jupiter either – and by now we’re less than a month from Saturn’s opposition, so we can look forward to that beautiful planet before summer’s end. Nice ongoing work with the comets. Your skies must be far darker than mine to pick these out. Thanks. I still haven’t dialed in the exposures though. Getting more blur and drift than I want, but maybe that’s how I’m able to get enough light to find them. As I know from my own corner of astrophotography, so much of it is trial and error. I have learned that I get my best results when I least expect them. The last few nights have been beautiful here, so I’ve been experimenting. 3 seconds isn’t enough to catch the comet (other than a small green point). 5 is enough but just starting motion blur. Hmmm…. Good news is I have a couple shots now that are same except for comet movement!